I seem to be one of those rare people who don't actually work for Google, but love Google Plus anyway. (We do exist!) In case you've been wondering what I've been up to, your best bet is to follow me there. Unlike my Facebook account, my Google Plus profile is public: so everyone should be able to follow me. I'll make longer, more detailed, more formal posts here when I have time, but for the vast majority of my posts, comments, and pictures will be available only via Google Plus. Again: If you want to see the cool stuff that I'm up to, follow me on Google Plus. I went to Costco the other day with my wife to pick up some Christmas lights. 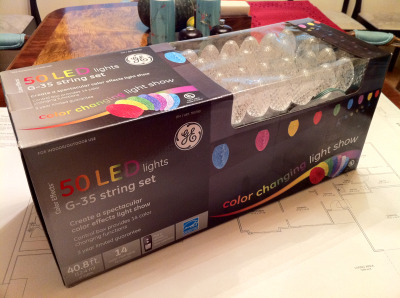 While there, I found the most awesome christmas lights ever: the GE Color Effects G-35. This string contains fifty "bulbs". 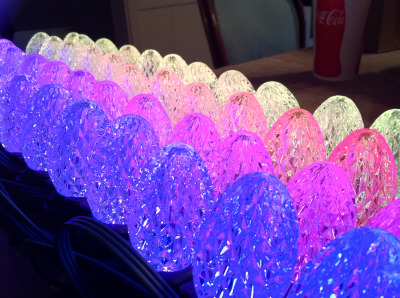 Each bulb contains a red, green, and blue LED—allowing for any color to be produced. The biggest drawback is how you control them: there are 14 pre-set "programs" that you can select, and they are all pretty lame. However, with a little reverse engineering and an Arduino (or any other microcontroller) they can be made into the coolest Christmas lights on the block. If you buy several strings, you could easily make a large 2D LED array. The possibilities are endless. At $59.99USD for a string (A tad over $1 per node), these things are a steal for what you can do with them. My christmas lights, hacked to display a rainbow. I wanted to share my efforts so that other people can give this a try. At the end of the post I have a link to the code I'm now using to drive my Christmas lights. Feel free to use it for your own hacking endeavors. UPDATE: See follow-up post here. The BBC ran an article on Monday about the effects of sensory deprivation. Several individuals consented to be locked individually in a fall-out bunker, without light or sound, for 48 hours. The results were both insightful and terrifying. This is just mind boglingly cool. It's called Automatic Photo Pop-Up, and it creates a 3D model from a single photograph. The results are breathtaking! Brush up on your ability to dig up dirt on that seemingly-spiffy date. This article discusses some of the advanced features of Google's search engine. If you are someone who finds yourself using Google often, it's worth a read. Oh yeah... One more thing... THIS! I came across an interesting article documenting the design process of making the spiffy new Fedora logo. This is a good read for anyone interested in graphic design and marketing in general. I found an absolutely fascinating blog today, and I highly recommend you give it a read. The description reads, "A gathering spot for ex-Googlers to reminisce and comment on the latest developments in search."